Dunouy exhibited at the Salon of 1795 several drawings (views of Italy or France) including a titled View of Casa Maria, on the borders of the states of the Pope and Naples under No. 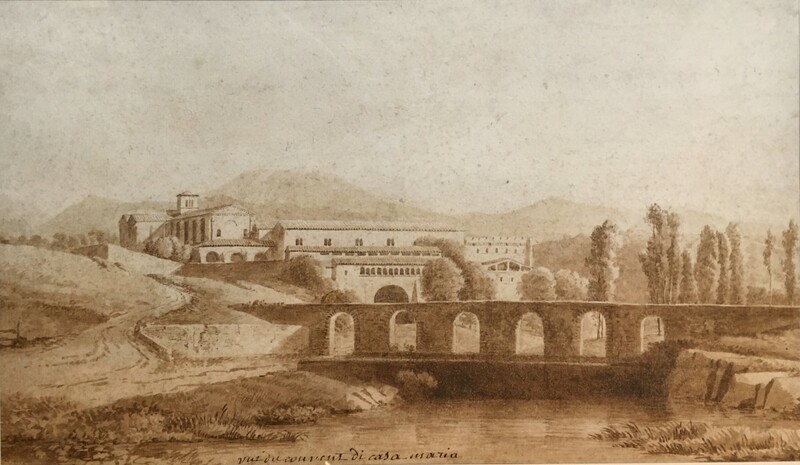 175, with the Salon of 1796 a version ( apparently) painted and titled View of the convent of Casa Maria under the No. 154. This monastery, now known as the Abbey of Casamari, was home to Trappist monks at the time, and was renowned for being the usual shelter for criminals and thieves from Roman and Neapolitan countries; it was closed by the Napoleonic troops in 1811. Contrary to what one can sometimes read, the place does not take its name from the Virgin Mary, but because it is at the place where the Roman consul Marius was born. It is located near Veroli (now Frosinone province), in the plain, and not far from Isola di Sora, a region particularly traveled and represented by Dunouy. The river is Cosa, a tributary of Sacco, itself a tributary of Liri. 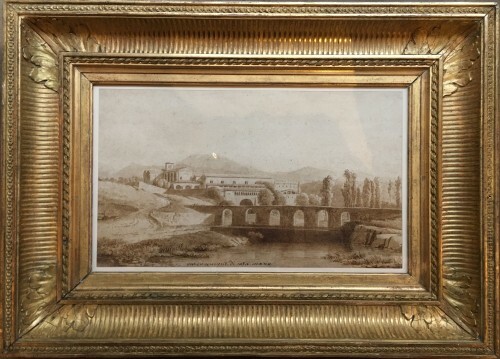 The iconography of the place is very small, but there is however an engraving of Bourgeois du Castelet, with a similar point of view, a few years later; it is about the plate N ° 37 (on 96) of his collection "picturesque Views and factories of Italy", which appears in 1803. 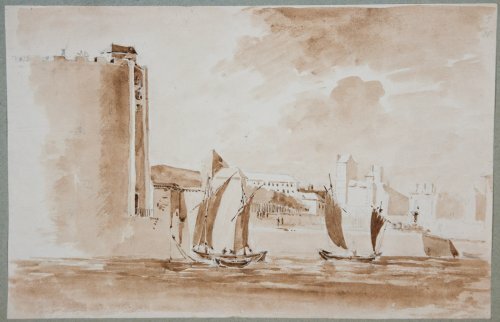 Another known sight, a drawing (41 × 56 cm) of English Richard Colt Hoare (1758-1838), titled Monastery of La Trappe in Casamare, executed in November 1790, and which was part of a set of 66 views ("Drawings from nature in the vicinity of Rome and Abruzzo, 1786-1790 ") Now preserved at the Yale Center for British Art (Paul Mellon Collection) in Connecticut. 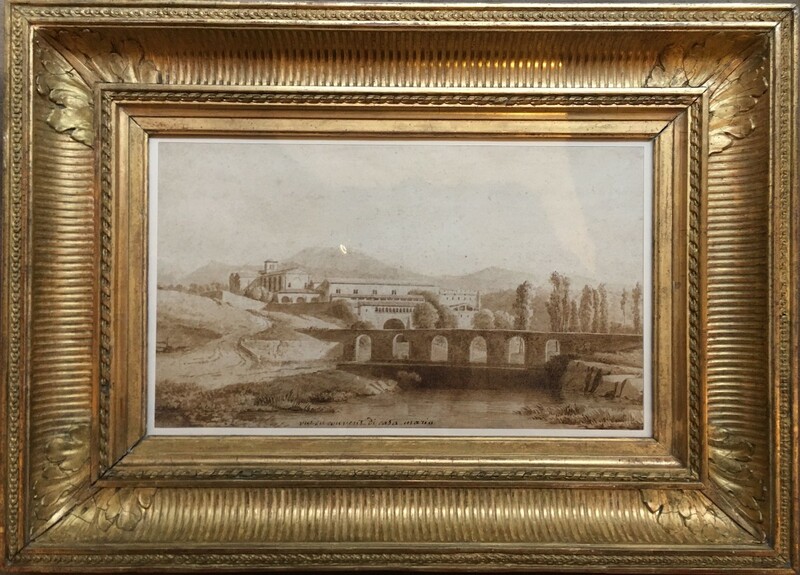 We can also find the convent of Casamari in a painting of Bidauld (25 x 35 cm, dated 1791, former collections of the Duke of Brissac), represented in a whimsical way at the foot of Mount Soracte (located north of Rome!). The whole of the work spontaneously recalls Dunouy, with familiar details such as the little path on the left, the treatment of the arcades of the bridge, foliage, or even grasslands at the edge of the water. The writing of the title is also that of the artist, and it is found for example on Parisian lavis of the late eighteenth century. 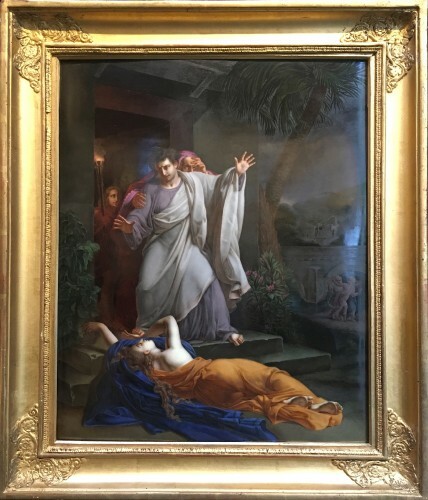 Important neoclassical artist of the late 18th and early third of the 19th century, Dunouy, with painters like Jean-Victor Bertin or Bidauld, in the tradition of the historic landscape initiated by Pierre-Henri de Valenciennes. He made several trips to Italy: a first time in the late 1780s, where he traveled the Roman and Neapolitan regions. 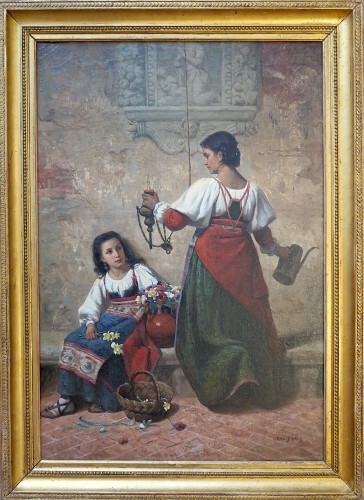 Another time between 1810 and 1815, when he was the official painter of Murat in the Kingdom of Naples. He continues to receive royal orders under Louis XVIII. 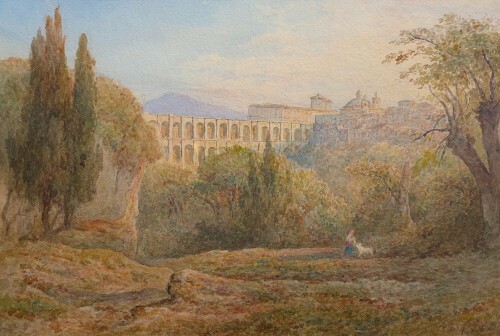 He exhibited at the Salon from 1791 (date of his return from Italy) until 1833.